Toy Story's inclusion in Kingdom Hearts 3 is revolutionary. For the first time in the series Sora, Donald, and Goofy will be meeting face to face with Woody and Buzz Lightyear. Speaking with Gameinformer, Tetsuya Nomura revealed some information about the upcoming world and it's inclusion in the series. 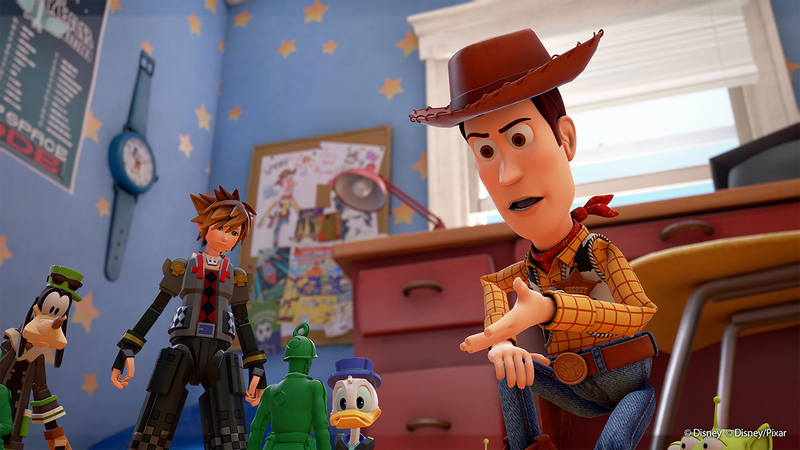 Nomura revealed that he's wanted to bring in Toy Story ever since Kingdom Hearts II, as he felt the film is iconic and made such a strong mark on the CG world. He longed for the image of Buzz and Woody meeting face to face, and bringing Sora in as a toy is something he's excited for and hopes fans feel the same way too. If it wasn't obvious from the decor of Andy's room, Nomura announced that the narrative of the world takes place after Toy Story 2. That means Jesse and Bullseye should be a part of the missing toy crew! Nomura laughs at how many round of reviews and back and forths it took to get approval on the story for the world. 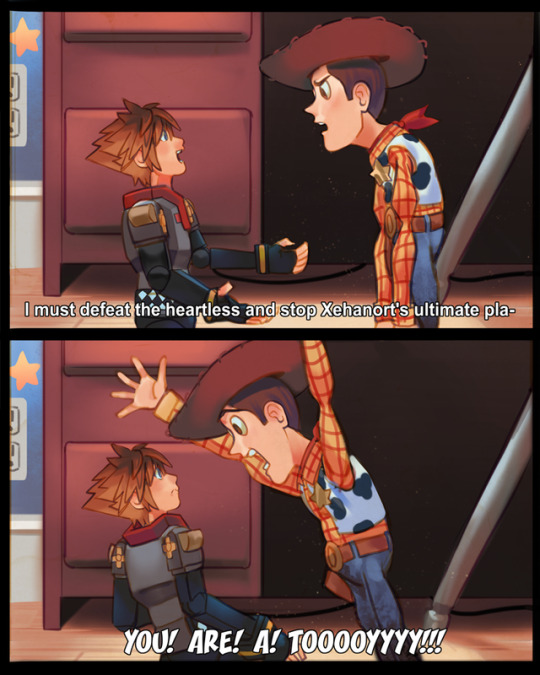 Kingdom Hearts is infamous for taking Sora and inserting him right into the storyline of a Disney movie. For this game, Pixar had other plans. If you loved the brief look at Galaxy World, the brand new toy store designed for Kingdom Hearts 3, then you're going to love the full version in the retail release. Galaxy World is where the main action occurs, as Sora will be searching for members of Organization XIII in the store. There are many floors and each one has it's own "personality". 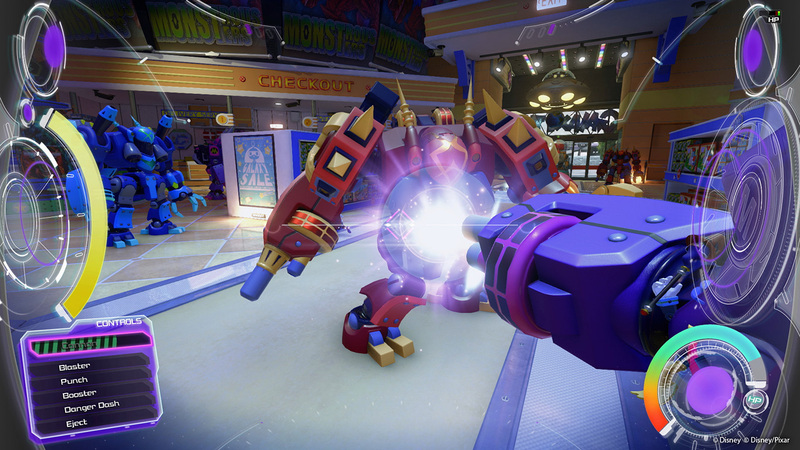 The robots that Sora and the Heartless can control in Galaxy World are called Gigas. Nomura reveals that you don't have to board them if you don't want to, they are optional. They were chosen as Nomura wanted to show that nothing is impossible for Kigndom Hearts 3. Sora can do a lot more thanks to this generations hardware. Make sure to check out the full article on Gameinformer! I love hearing that the worlds will be really deep and fleshed out. The only thing that worries me is that probably means that the number of Disney worlds are reduced. I can't remember if Nomura ever said KH3 would have more worlds than KH2, but I feel like we might get about 8-10 Disney worlds. It's also pretty interesting to hear Pixar request that they do an original plot and that they had to review/approve the story. To be honest, that should have been the attitude for almost all of the worlds. I'm really excited to see what else Galaxy World has to offer. The floor they're on is probably the robot toy floor, but there might be dinosaurs, cars, Barbies etc. and those can all create such a diverse world. Kinda mixed feelings on this, a Disney world where the bulk of is original areas not from any films kinda semi-defeats the point a bit. But I suppose creative liberties are a given if you're trying to tell a new story in that world. So are they self-aware toys as well? They probably ain't gonna be too happy about being used. I don't recall Nomura talking about the number of worlds, but I'd rather play 5 amazing worlds than 10 average or lackluster worlds. I am so happy to see that Nomura is addressing the criticism of the Disney story worlds and is working on an original story to put into this world instead of rehashing the movie plots like KH2 did. 8-10 would be the magic number. There's at least six original worlds we need to go to so this game is going to be massive if it has 8-10 Disney worlds of this size. If we get the max 10 Disney worlds and I'm just guessing but say these worlds take 3-4 hours to complete because of the scope we've seen. And say each original world takes about two hours plus a fourish-fiveish hour endgame world. Then you're looking at a 50-60 hour game just to get through the main story. I think that's pretty optimistic and a hefty game right there. I'm liking how Toy Story is sounding..though a little down on the lower possible worlds,only because it lowers the chance of a few world i want making it in. [FONT="]TN: With every Kingdom Hearts title, we plan to deliver more worlds than actually appear in game -- so we have something in our pockets to work with. Then as we begin to hone these worlds and stages, and some do get cut. [At this point], we have prepared more worlds, in that respect, than Kingdom Hearts 2. Let's hope it goes through. P.S. Yup. New here. Be sure to say hi if you want to. This quote from Nomura just adds on to my point that tangled was announced too early just for the sake of having a Disney world announced. Could have had the option to cut it as development went on and saw the worlds are all new movies. I think that's what theyre going for at this point though, the new 3D movies are probably a lot easier to recreate in UE4. I think there's way more deserving than tangled though if we're getting less worlds, but I know people are gonna disagree with that. I think I missed something. So this 'Galaxy World' is the 'Toy Story World,' Yes? Galaxy world is the toy store. It's the mech suit location. You go from the room to outside and travel to the toy store where the rest of the world takes place. Yeah not to be a downer but I would disappointed with less than 10 Disney worlds. I mean, I agree I want a denser experience. But, I did love all the different kinds of environments we got to see in KH2. I would like that feeling in a game with better level design lol. As for the story, I am ecstatic its original, I guess I am a little iffy for Galaxy Toys to be the main part since yeah, its just original. But I mean I'll live with it. Like I would have loved Al's Toy Barn or Pizza Planet to show up...but oh well. I guess its a weird consequence of a completely original tale. I also hope that doesn't mean more worlds in this game will follow the movie plot than I originally thought tho. That is still the worst lol. Like since Nomura is acting like its such an original thing. I do want it to be the norm rather than the exception. Wait, what exactly are these 6 original worlds? That sounds like almost too many tbh. I could see 4 maybe? Tangled was what started whats arguably the second Disney renaissance so yeah, I would say you're in the minority with that opinion. I mean you may be right about the new movies being easier...maybe. Tangled is the most expensive animated movie of all time because of Rapunzel's hair. I genuinely think they may still not have her model done because they decided to make her fight with her hair of all things apparently lol. Its sketchy that, as you said, it was the first world announced yet we have barely seen it. As for your other point, there is no evidence of that yet at all. I mean, Toy Story is 20 years old dude, I would hardly call that new lol. I kind of like the fact that Pixar wanted Nomura to make an original story. I now wish this was done with every world to keep it entirely new and fresh. Also with them saying it takes place between Toy Story 2 and 3 it almost feels like it not only builds the KH canon but also could possibly be considered Toy Story canon since it doesn't affect the overall franchise. These original sub plots of the game could technically pass as canon for the Disney movies if it doesn't mess up the story. However I like the familiarity and childhood moments of redoing movie stories in KH as well. I just thought it was an interesting point. Keep in mind, this is on PS4 (compared to the previous two big games which were on PS2) so it is not outside the realm of possibility to include many large, deep worlds. KHII had a total of fifteen playable worlds; I feel like we could easily see twenty worlds total (both original and Disney-based, of course). I mean, that was mostly a KH2 thing I feel. Like, unless you remember Ariel wanting to travel to different worlds and not the human world, or Jack Skellington training the heartless and not trying to take over Christmas in their original movies lol. Everything in Olympus has been implied to take place after the movie, I also feel Neverland, Wonderland and Deep Jungle, while maybe more similar to their movies in some ways, were still rather different. And then Pinocchio definitely didn't take place in a whale for very long lol. But yeah, I dunno, I feel the best plots in KH2 were the original ones as well. Beast's Castle had the best Org XII integration by far, and Space Paranoids was so great the way they tied it to Radiant Garden. A lot of others were stale cuz it was a worse version of the movie with Sora there lol. Not really a great reason to put it in the game imo. There are other ways to pay homage to an influential or iconic work, but the first consideration for what to concentrate on when telling a story ought to be "what is my story about." Kill your darlings and all that. Hopefully this means good things, but it could honestly mean anything. Filler is often "original" in its function, but that doesn't make it especially appealing. This sounds interesting, but I really liked the way the suburban areas looked (bright, natural environments are my preference) so hopefully they don't limit that too much. What we saw of Galaxy World just reminded me of Deep Space from BbS which was...not awful, but not my favorite. Jumping into a mech suit and shooting lazers at enemies? Games have been doing this for decades. What does this sentence even mean? The Gigas look standard to me. Fun, maybe. A sign that these games have made huge advancements? Pfft. This gives me the most hope. Less Heartless/whatever enemies, more layered level design and secret passageways and integrated minigames and puzzles. One Deep Jungle playthrough with its Jungle Slide, Vine Jumping, Film Collecting, Globe Spinning, Ingredient Cooking, Flower Magicking fun is better than ten Las Cites de Cloches with its...walls? Just think of all the original worlds we have. I just threw the six number out there, but we already know twilight town and keyblade graveyard will be in it. (I think you could argue realm of darkness will make a brief appearance since they already have the assets so why not). Then you have the world that never was, radiant garden, the land of departure/castle oblivion, daybreak town, and destiny islands. I think you could easily argue at least three of those will be playable in at least a minor capacity. Then that doesn't even include the possibility of a new original world. They've already got these worlds designed so it shouldn't be that much to recreate like the Disney worlds where they have to design the level layout, especially if they are only brief visits and you don't explore the whole world. My definition of new just means cgi films of the last twenty five years I guess. I guess I didn't mean new, just the computer generated era. I don't want everything to be cg pixary films which they all are so far except for Olympus. Something like emperors new groove which is after toy story, doesn't have that cg feel. Ah, so yeah, I know Twilight Town is in for sure, and I think Radiant Garden must be also. And I do think LoD will reappear but renamed which may double as the 'new world', this is if my theory that this mysterious Cable Town we have heard of years ago is just LoD expanded. I could see them retconning Keyblade Graveyard as where you NEED to form the X-Blade lol, but I do expect it as well. I don't think the World That Never Was is really important anymore though? And I don't think we will see Daybreak Town really, maybe, but yeah I don't think its necessary really. And Destiny Island I feel will be cutscenes again lol. So yeah I guess I am sitting at 4 still for full worlds. But maybe more for small snippets/cutscenes yeah. And ah okay, I guess its a Disney classic to me still, 2D or 3D. But I get that. I guess I also still think we will get more than just Olympus. I actually think Jungle Book and Treasure Planet have high chances of being included. Also that Agrabah has a high chance of returning. And I could probably name more but those 3 kind of top my list for what I think has the highest chance if they don't throw curve balls ha. I agree I don't think daybreak will be in the game other than maybe a cutscene at most. I thought there was an interview awhile back about there being a battle at keyblade graveyard so I just assume that's in. Destiny islands they have the assets for so I could see a short visit there just for one boss fight. You don't think the world that never was will be used by the new organization to meet and discuss things? I guess it could be cutscene only, but I could see a couple fights happening there. It's pretty iconic with the series now. I think radiant garden will be the hub with the only place of final fantasy characters. thats kind of the minimum of full worlds so it's four at a minimum plus snippets of all the other worlds they'll have which I've mentioned. This game is just going to be massive in scope, there's really no way about it the kingdom hearts universe has grown so much. It's sad knowing there's going to be stuff omitted that you would have expected be in the game. A lot of good news this turn. It's nice to see that Pixar still has good sense when it comes to this (well, they did make some of the most inspired movies to date) and asked for an original story. I also like that some mechanics are optional, meaning hopefully the game won't be trying to hold my hand every second. The only world that seems to be on track for following the movie plot is Tangled, but that's understandable since there's not much else you can do and have Rapunzel's hair still flowing. I like the idea of each level of Galaxy Toys having it's own "personality". 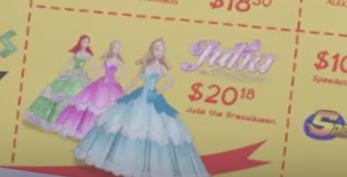 I hope the Julia dolls have their own level (I love that they designed their own original toys!) and I hope the highest one has a secret Zurg boss! The plot taking place after Toy Story 2 was a given. The room matches Andy's room completely, there's a movie stub for a ticket that Oracle Spockanort informs me fully confirms it's place after 2. I do hope we get to see Jessie. I love me some Joan Cusack and a Bullseye mini-game would be fun! Man, this makes me really happy. Here's hoping even more worlds will have an original plot! I haven't seen the series, but the fact that she's in the tower points to pre- or during the movie, yeah? It takes place after the movie and before the short-film "Ever After", which means Rapunzel and Flynn still haven't married. Having the King and Queen actually talk would be nice too,since they didn't in the film. I'm well aware of the basic plot, but it's the tower that is making me believe it won't take place post-film and post-TV series. Oops. I thought you were talking about the tv-series when mentioning the tower, my bad. I actually like it when the games follow the movie plot because then we actually get to fight some of our favorite villains from those movies. Toy Story having an original plot disappoints me a little bit because there are tons of characters I would have liked as a boss fight. Also I love seeing Sora put into the movies plot to see how he affects it. In Mulans world I loved seeing him join the imperial army and being apart of it, and then fighting Shan Yu. Original worlds are great too, as I did love Beast's castle. I guess just for certain worlds I would rather see SDG react to the actual movies plot. You can still have them. Original plot doesn't mean no villains from the movie. KH1 Halloween Town had no mention of Christmas whatsoever and the boss was still Oogie. Also I love seeing Sora put into the movies plot to see how he affects it. He really doesn't. That's the issue. In Mulans world I loved seeing him join the imperial army and being apart of it, and then fighting Shan Yu. "Being a part of it" is really a stretch. Original worlds are great too, as I did love Beast's castle. That's not even that original, the main premise was still there, and the Beast acted exactly like in the movie. It'd be neat if Galaxy World and the Gigas show up in Toy Story 4, even if it's just referenced on a poster. Also Gigas need to be a real toy. It's not just creative liberties but legal liberties as well. You have to remember that a lot of toys featured in Toy Story were sponsored toys like Barbie. It's so much easier on Pixar and Square Enix's part to create a new area for an established world as oppose to re-negotiate contracts for licensed intellectual properties outside of the Disney hemisphere. They don't even acknowledge the BLoSC show, really doubt KH would fair better. I don't see an issue with Disney Worlds having an original plot, nor do we know if this will be the case with every Disney World, seeing as how Nomura mentions that Pixar requested it for Toy Story, but we don't know if they, and the other people in Disney, did the same for the other Disney Worlds. Other than that, I'm honestly expecting more than six worlds. But even if we did get a few amount of worlds, it's better for them to be full of quality. We know for sure Olympus Coliseum and Big Hero 6 are going to be not the movies, and Chaser was discussing about Tangled being the movie due to the nature of the characters. So it's a three out of four for now, it's a good streak. Not even KH1 had all original stories. Keep Star Wars as a world out of my Kingdom Hearts, please. Thanks. Next probably won't be Frozen, I don't see it. I think they'll announce a Frozen world as a last, or at least close to before the game releases, so it gets really hyped, since we know a good number of the sales will come from Frozen fans. They'll want this world reveal to be the last. Even if Square Enix wanted to add Star Wars, this legally prevents them from doing so. I'm really wondering if, since Pixar worked alongside the team on creating the storyline for the world, we'll see some of the typical Pixar easter eggs, such as the Pizza Planet truck or the Luxo ball hidden somewhere in the world. I think it would be really neat to see the truck parked across the street from Galaxy World, or Luxo hidden under Andy's bed or something like that. KH isn't a SW game, and SW has been in infinity. Eiterway i'd prefer if they stuck with Disney and Pixar. Why not have them go to Al's Toy Barn instead of Galaxy Toys? You could've still had an original story. Do you not understand the legal technicalities of this deal? EA is the only third party developer and publisher that can represent Star Wars in video games. No other third party publisher including Square Enix is allowed to represent Star Wars because that would be breaking this contract. And before you bring up Lego Star Wars, that franchise occurred before Lucarts was shut down by Disney and Disney exited first party development. Disney Infinity was developed by a Disney subsidiary at the time. It's not as exclusive as you think. LEGO Star Wars already is an outlier. You make it sound like EA and Disney wouldn't discuss allowances. I was really hyped for this when I first saw it, but now reality is setting in as I read the comments. I don't mind that Toy Story has a brand new story. We might see some references from the other movies, but I don't care. I used to watch the Buzz Lightyear cartoon, watched all three movies, and some shorts. There are different stories every time, different scenes. As long as Buzz and Woody and Andy's room is in it, that's cool. The fact that Andy's room is in it shows that they didn't have to omit settings from the game, just had to create an original story. It will also be surprising, like Sora is joining the Toy Story game on a new adventure. That's awesome. But I am concerned that Nomura felt the pressure to release this game so fast, to set a release date so close, a lot will be cut. I really want this to be a bang-out game, since it ends this saga. I hope there will be more worlds. Dream Drop Distance really didn't have that many worlds, neither did 0.2 fragmentary passage (of course not). But I don't want KHIII to be like those games. I bet Tetsuya just wants to be done with this. He looked so tired at D23. But again, Lego Star Wars was created way before this deal existed, and it just so happens to be profitable enough to be the exception to the rule. Honestly, unless there's been a Star Wars game that's been published by a third party publisher (since Disney exited first party development), then I just don't see it happening. Of course, I'm open to be proved wrong. Hmm, well it being like an original transitional story between Toy Story 2 and 3 makes it more interesting... I always did want an original Kingdom Hearts Disney story, so it feels like you made a difference in that world and not it would've happened anyways in the original story. Probably due to Pixar's insistence on it having an original story. Going back to old locations may have seemed like recycling to them. Plus GW has different themes for each floor, something that couldn't really be done with the toy barn. I think it's fantastic that they are doing an original plot for the Toy Story world. Hopefully they do an original plot for all worlds. Hearing this news, it seems they're on the right track! It also has to do with legal-licensing issues. Better to make an original plot, than to expend on legal issues. Yes please to less worlds. I want each world to be phat and interesting. Save other properties for later and give us a base completion timebof approx. 28 hours, 100% taking around 60. I'd rather have it 50/50. Tangled and Frozen definitely deserve to follow the story of their movie counterparts. And even if they do that, that doesn't stop said worlds from being lore relevant. I'm glad to see they're taking more care with the worlds! It's setting a high bar, but I hope to see at least 20-25 more worlds to explore, there's just way too many Disney films that I want to explore deeply in KH3. Square have already bypassed that by creating their own line of toys for the game. I'm glad that Disney is FINALLY acknowledging and giving KH & Square the attention they deserve by being more involved in the development of the game. Sure, they've always been involved, but not in this capacity. This game will have a promotion campaign of monstrously proportions if they keep this up. I was honestly expecting Frozen for it being a monster marketing wise, but this is WAY better! Toy Story is universally loved unlike Frozen which has its detractors, but man I wasn't prepared for this visual delight featured in this Toy Story World. It's incredible how Square Enix nailed the artstyle. That kingdomShader can really pull mmiracles. Lol, that's a better deal than the Weekly Jewels Extravaganza deal so I'm game. They still seem to underestimate Kingdom Hearts popularity. When the opening presenter was announcing the games you could tell he was a bit shocked that Kingdom Hearts got the loudest applause. Hopefully this gets them more invested in assisting Square Enix with KH. Yeah, I was so happy when KH received the loudest pop from the audience. Disney has treated Square like that weird guy that you don't want anybody to know you're being friends with for a long time now. Glad that seems to be changing after this year's D23. I've noticed that the enemies now attack Donald and Goofy. In KH2 the enemies ignored them, i'm glad they fixed that. Sora: Woody, I have to assemble the seven guardians of light before the 13 Seekers of Darkness tried to unleash Kingdom Hearts and release the darkness to all the worlds with the heartless and the nobodies and the unversed in the dream eaters!!!!! Woody: YOU. ARE. A. TOYYYYYY!!!!!!!!!!! The fandom certainly works fast. woody: sora, behind you! a heartless! Although I'm late to the party, I want to point out that the Hercules's Olympus Coliseum is NOT taking place after the events of the movie. True, the majority of Olympus' plot in previous games is original due to the inclusion of Final Fantasy characters like Zack (BBS), Cloud, and Auron (KH2), but it still takes place during the film's events. I mean Birth By Sleep has a young Hercules training with Phil even though it is at the Coliseum and not in Phil Island from the film and the Olympus plot in Kingdom Hearts and especially Kingdom Hearts II is taking place during the middle of the movie and introduced more characters from the film such as Megara, Pegasus, and the Hydra. And while the plot is original it did draw some references scenes from the film such as the Hydra attacking Hercules and Hercules saving Megara even though it's done in a different fashion. Now that Disney including Walt Disney Animation is involved with the Disney worlds, from what the latest scenes we've seen for the plot on Olympus, yes part of the world is original as Sora is coming to this world to train with Hercules to get his powers after what happened in Dream Drop Distance but it's also following the climax of the movie when Hades frees the Titans from their prison and launch their attack on Mt. Olympus. I disagree with Olympus, from what we've seen so far from the latest E3 trailers (although you were well aware of it following it's reveal), it's following the climax of the movie when Hades frees the Titans from their prison and launch their attack on Mt. Olympus, heck you even got the Wind and Lava Titans appearing for the first time in the KH series. So while yes part of the world is original as Sora is coming to this world to train with Hercules to get his powers after what happened in Dream Drop Distance, Disney including Walt Disney Animation Studios is involved with the Disney worlds including Olympus as they're putting in more locations that weren't shown in previous games such as the rest of Thebes and Mt. Olympus. Lastly, I believe that this might be the last time we will visit Olympus in the Kingdom Hearts series cause while it's fun going to the world for the tournaments and a main staple of the KH series, I don't think they should push the limit as normally with the Disney worlds that follow or take place during the film's plot normally they have a beginning, middle and end (e.g. Mulan, Beauty and the Beast, Cinderella, Snow White, Lion King, Little Mermaid, Nightmare Before Christmas), along with the fact if Nomura and his Team have more material that they can expand on from these Disney films. Speaking of which, the same thing applies to The Caribbean (Pirates of the Caribbean) as it's adapting the third film, At World's End and the fourth and fifth films take place 20 years after the third movie, so I don't think we'll be coming back to this world for a while in the next games of the saga. Not even KH1 had all original stories. Yes and no with the Disney worlds in KH1. Personally, the one you can say that were loosely following the plot of the movie was Agrabah, but with Jafar trying to seek the World's Keyhole. But the majority of the Disney worlds such as Deep Jungle (Tarzan), Atlantica (Little Mermaid), Halloween Town (Nightmare Before Christmas) were completely original and unrelated to the actual films. And despite what most people keep on saying that EVERY world since KH2 "retells the movies plot" is NOT true. For Kingdom Hearts II Disney worlds such as Halloween Town, Beast's Castle and Space Paranoids were completely original especially the later two worlds as they were connected to the main storyline. Olympus (aside from KH3's plot) is original, yet it still took place during the film's timeline. Neverland in Kingdom Hearts and Birth By Sleep was also original and unrelated to the Movies. Terra, Aqua, and to a lesser extent parts of Ven's visit to Deep Space (Lilo & Stitch) was also original and unrelated to the movie. And Sora's story for the Grid in Dream Drop Distance was also unrelated to the plot of Tron: Legacy. Bump another thread and you get an infraction.